The fight may be in Mississippi but Tennessee will be well represented tomorrow night when Legacy FC and RFA come together for one historic night. The two promotions will pit some of their shining stars against each other including a battle of their best flyweights for the AXS TV super fight title. Adam “Primetime” Townsend will be making his RFA debut. The eastern Tennessee native will make the nine hour journey to Tunica for the biggest fight of his career. Just a few years ago he was just a fan of the sport and now he boasts a 12-3 record with an impressive six fight winning streak. Townsend will meet UFC veteran Yuri Villefort (6-4). Primetime has spent the majority of his career fighting locally in Tennessee . While on BluegrassMMA Live this week Townsend talked about the pressure and fight. The pressure is on Yuri. He’s a coach for the BlackZillians, what’s he going to do when a redneck from Tennessee beats him? Legacy FC’s Brian “The Law” Hall will be part of the main card alongside Also from Tennessee, Hall fell short in the Legacy title fight back in October. Prior to that he notched wins in his Legacy debut as well as in Bellator. Hall has shown he can end the fight as six of his seven wins have come by way of stoppage. Hall meets Kevin Gray. Gray will be making his third appearance for Resurrection Fighting Alliance. The flyweight dropped his professional debut for the company but has reeled off five straight victories. 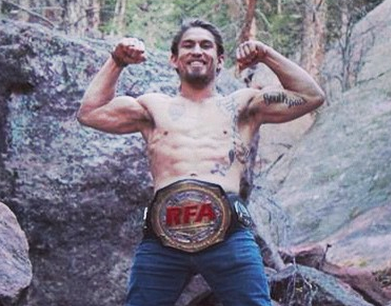 Nashville’s Luke Sanders will be making his first RFA title defense. He meets Terrion Ware in a fight that will more than likely send one fighter to the UFC. Sanders has been unstoppable as a professional. Ware will be very athletic and well conditioned for the fight but in my years of watching MMA I have found few that can handle the pressure and aggression of “Cool Hand” Luke. RFA vs. Legacy 1 goes down tomorrow night from Tunica, MS and the PMN crew will be on hand. Stay close to ProMMANow.com for more on the event. Here is a look at the main card, which airs live on AXS TV.